We recently visited the lovely Branislav Dešković art gallery in Bol, and really enjoyed seeing some local art. Bol, of course, is on the south shore of Brač, an easy day trip from Jelsa. The art gallery is housed in an old renaissance-baroque palace (dating back to 1694), right on the waterfront. Inside the courtyard there’s a modern glass-fronted area that houses special exhibitions in the summer months. From June to September, the space is given over to a different artist every two weeks. I was sorry that I’d missed the earlier shows, as the brochure showed some very exciting art! 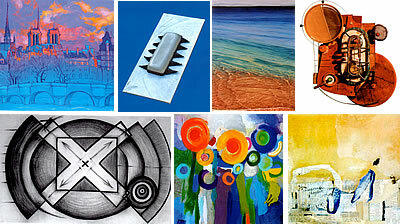 Artwork from the summer exhibitions 2012. Top row: Anamarija Botteri Peruzović, Vesna Ristovski, Perica Doljanin, Vedran Karadža. Bottom row: Gloria Oreb, Rinella Ivanković, Lidija Šeler. However, we were in time to catch the final exhibition of the summer, a collection of wonderful sea paintings by Perica Doljanin. He’s a local artist, born in Split, and he’s also the director of the gallery. 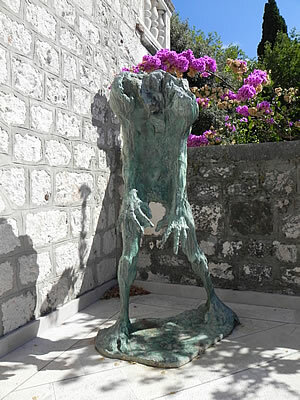 Brač has a stronger artistic tradition than Hvar, particularly in sculpture and stone-working. The famous Brač “marble” is in fact a very beautiful white limestone that’s well on its way to becoming marble but isn’t quite as hard. The town of Pučišća (that’s pronounced Poo-cheesh-cha, by the way) has a famous school of stone-working, and it’s from that long-standing tradition that the island’s best-known artist, the sculptor Branislav Dešković comes. 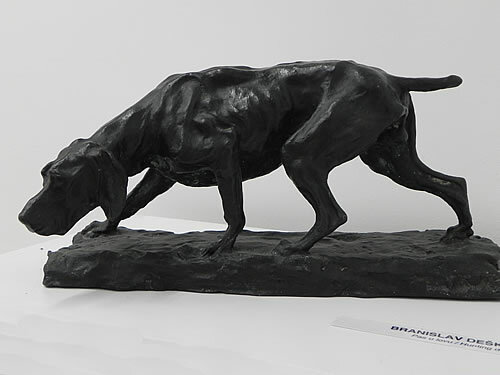 You can see examples of his work all around Bol, beautiful bronze sculptures in a perfect setting. 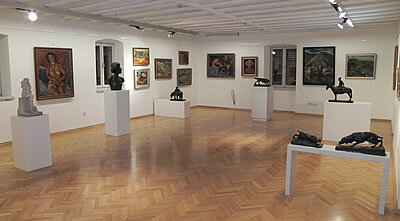 The Bol art gallery was founded in 1963, and named Branislav Dešković in his honour. 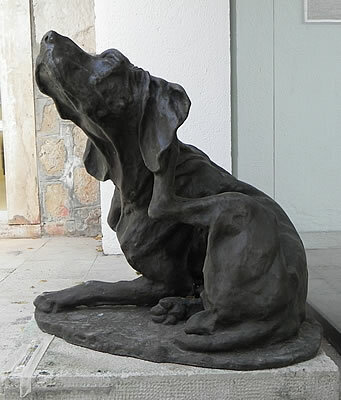 In the courtyard is one of Dešković’s hunting dogs, permanently scratching its ear! His portraits of the dogs are wonderfully animated, so full of character. The tension and readiness to spring into action are beautifully captured. In addition to the dogs, I particularly enjoyed his Bosnac na konju (Bosnian on horseback) series. It results from a roadtrip he took in Bosnia, and again, these small bronzes have so much character. The poor guy looks exhausted, not to mention his horse! 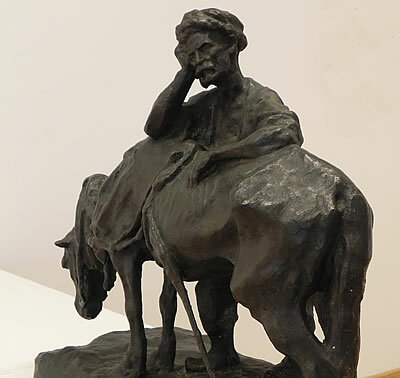 The other bronzes figures that stand out for me are by Valerije Michieli (also from Pučišća). Now this man seems to have been tormented by nightmares, certainly his Talac (Hostage) conveys a world of anguished emotion. His dogs look thoroughly emaciated and I really didn’t feel at all comfortable about the poor things. Strong work and really does makes an impact on the viewer. Of the painters, my favourite is Ignjat Job. 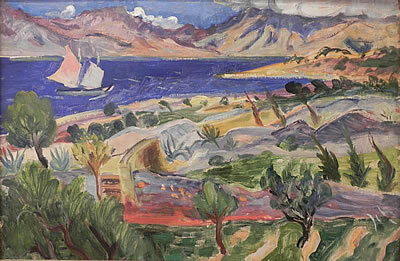 He lived on Brač in the 1930s, and is often compared with Van Gogh. It’s a valid comparison, both had their mental demons and were subject to fits of depression. Job’s painting style is bold and makes strong use of colour and texture to convey the mood. 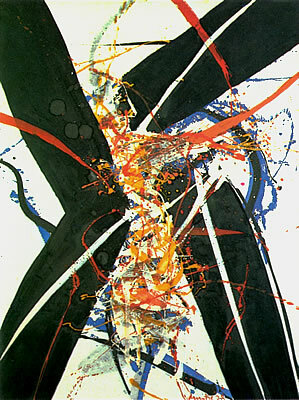 The Bol gallery has several paintings of his, which was a great treat. In fact the Bol gallery holds the largest collection of Ignjat Job’s work. They’re wonderfully evocative scenes from island life, ranging from landscapes to wild dancing on the beach! 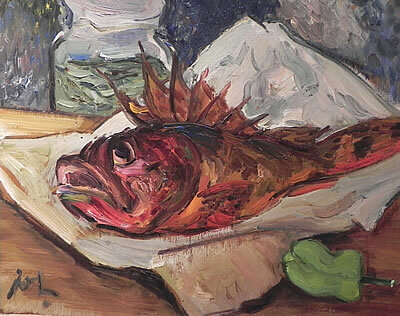 Now, I generally don’t usually like paintings that could be called Still life with fish, but in the hands of Ignjat Job, the subject really came alive, so to speak! I love his lively brush strokes and the ever-so-yummy colour. This would be my favourite painting in the gallery, the one I’d love to take home with me. 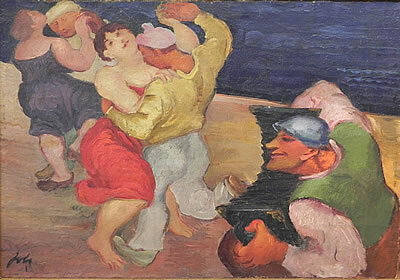 The gallery also has a couple of pieces by another of my favourite Croatian painters, Edo Murtić. His bold colourful abstracts call to you from across the room, absolutely wonderful. 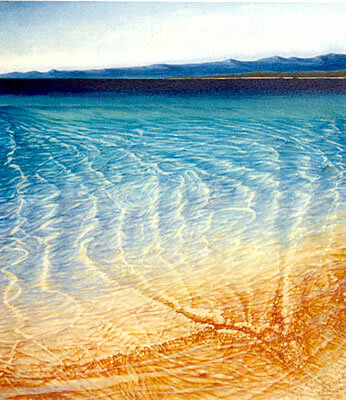 His summer studio was in Istria, and he spent time travelling the length of the Croatian coast. It’s good to see there’s also an artist from Hvar here! 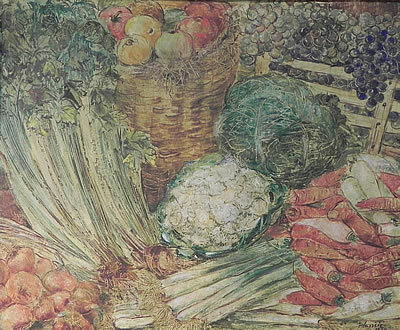 Juraj Plančić was born in Stari Grad, and was generally known for his landscape paintings, especially his Paris scenes. He has a light, delicate touch, and I enjoyed his whimsical collection of vegetables! 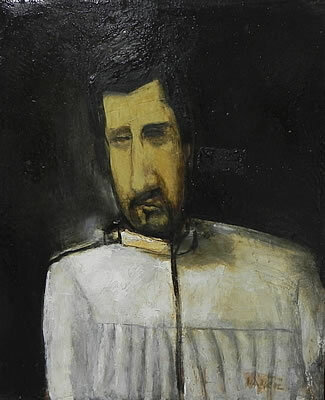 And I must also mention a really strong and compelling self-portrait by Ljubo Ivančić. Look at that rich patina and texture – so expressive! Founded in 1963, the gallery has three floors of art to enjoy, and their permanent collection includes many artists (over 30 painters and 10 sculptors) with a local connection – either they were born nearby or their art deals with local themes. It’s good to see that they also keep everything current by bringing in new artists for special shows. How wonderful to see a thriving art gallery as part of the culture here! During the summer, the gallery is open daily in the mornings and evenings. Reduced hours apply in the winter.